The Museum of Art, Architecture and Technology (Museu de Arte, Arquitetura e Tecnologia) (MAAT) is the new cultural project for the city of Lisbon that is focused on three areas - Art, Architecture and Technology. 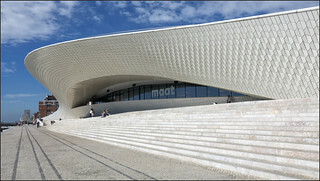 The €20m museum sits on the River Tagus (Rio Tejo) to the west of the city centre and is "one of Europe's most lyrical new museums". It establishes a connection between the new building and the Tejo Power Station, one of Portugal's most prominent examples of industrial architecture from the first half of the 20th century, and one of the most visited museums in the country. The museum is designed by Amanda Levete Architects. MAAT's ambition is to present national and international exhibitions by contemporary artists, architects and thinkers. The programme also includes various curatorial perspectives on EDP Foundation's Art Collection, reflecting current subject matters and trends.